Another shopper has reportedly discovered a note from a factory worker in article of clothing purchased from Primark. According to Amnesty, it reads: "We are prisoners in the Xiang Nan Prison of the Hubei Province in China. Our job inside the prison is to produce fashion clothes for export. This is the third time within a week shoppers have reported finding notes from workers in their clothes. Earlier this week, a woman in Wales reported finding a note in a $10 dress from Primark which read "forced to work exhausting hours." Rebecca Jones also found a note in a similar dress from Primark which read "degrading sweatshop conditions." "These three-quarter crop trousers were last ordered by Primark in early 2009 and were last sold in Northern Ireland in October 2009. We find it very strange that this has come to light so recently, given that the trousers were on sale four years ago. We will be contacting the customer to obtain the trousers, so we can investigate how this occurred and whether there are issues which need to be looked into. Nine inspections of the supplier have been carried out by Primark's ethical standards team since 2009. To be clear, no prison or other forced labour of any kind was found during these inspections," the statement said. 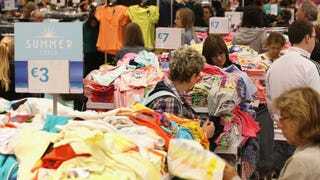 Primark said it is launching an immediate investigation into the matter.